With the number of school staff who are part of your child's learning experience, it could get pretty expensive to purchase Christmas gifts for all of them. So as a little token of my appreciation this year, I plan on making for them some homemade candy, one of my favorites being peanut brittle. And how can it get any better than homemade...dip it in chocolate! Melt first three ingredients in a microwave safe bowl for about 3 minutes or until melted. Stir in the peanuts and microwave another 2 minutes. Stir in butter and vanilla and microwave again for 45 seconds. Remove from microwave, stir in the baking soda and working quickly, using 2 forks spread the mixture on a baking sheet sprayed with cooking spray. Let the brittle set until hard, about 10 - 15 minutes, and then break into smaller pieces. Melt the chocolate morsels in the microwave for about 2 minutes, checking once or twice to make sure they are just melted. If you overcook the chocolate the oil will separate out and then the chocolate becomes dry and lumpy. Dip one end of the peanut brittle into chocolate and lay on wax paper to dry. 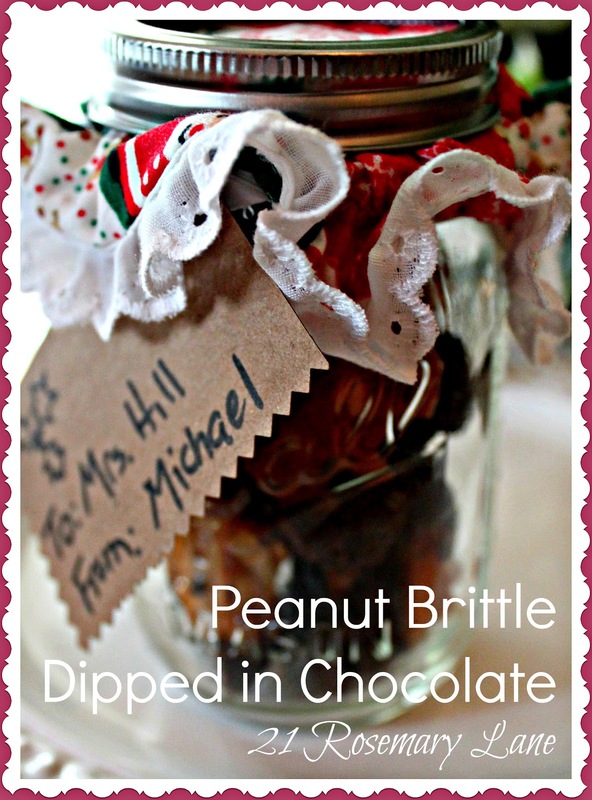 You can make this little treat into a gift by placing the brittle in a mason jar and adding a tag and some festive fabric to the top. A cute store bought ornament can be tied on with the tag, or for a teacher, tie on a gift card. Isn't this a darling idea? And pretty inexpensive to boot! I plan to make a few different types of candy to gift out this year...I'll even get the kids to be part of making the candy. What fun for them to be part of the process. SPECIAL NOTE: Thank you so very much to my dear friend and hair stylist Lena for inspiring this post! You rock girlfriend!!! I AM going to make this! 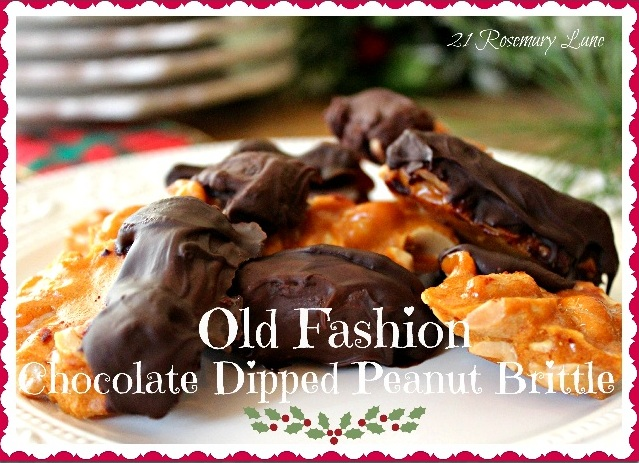 Peanut brittle in the microwave and dipped in chocolate? Oh yes, please! It's a Holly Jolly Dining Room!